The Journey of a Thousand Miles Starts with Juice! 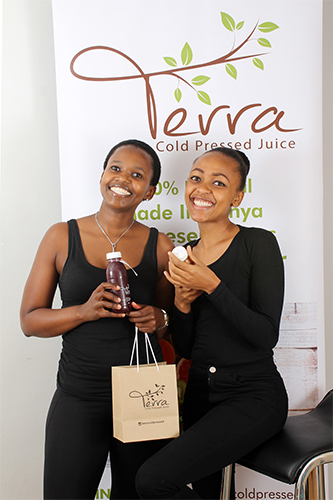 Kenyans, in particular urban dwellers, are growing increasingly conscious of the benefits of leading a healthy lifestyle, and the demand for products, events, and services that complement such a lifestyle is increasing. It is, however, not easy to find authentic products that support this desire for cleaner, healthier living – many of the products that are referred to as ‘fresh’ and ‘natural’ contain added sugar and preservatives. Our answer: Terra Cold Pressed Juice. In much of Europe and the US, juicing has become a trend in recent years. People have become more and more health-conscious and they look for ways to incorporate more nutrients into their diets! Enter the Cold Pressed Juicing movement! 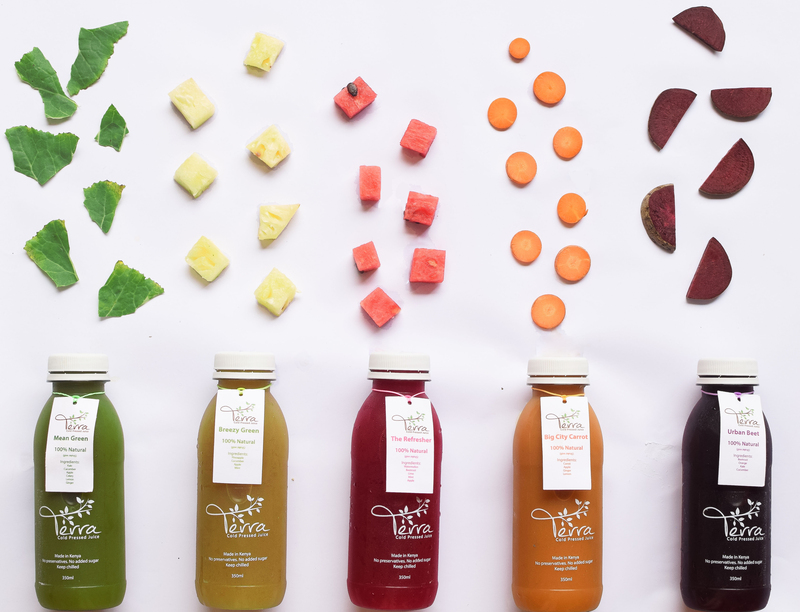 ‘Cold Pressed Juice’ refers to juice that uses a hydraulic press to extract juice from fruit and vegetables, as opposed to other methods like centrifugal or single auger. 2. 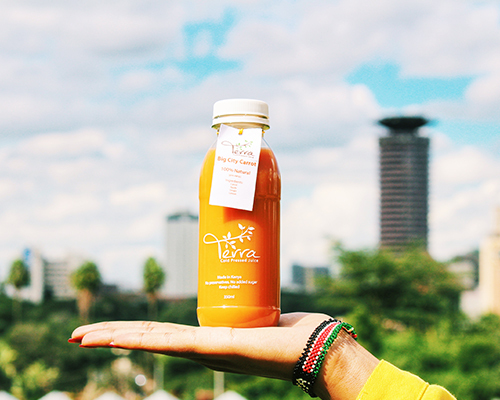 As a rule, there are ZERO additives to Cold Pressed Juice. No preservatives. No Sugar. No Sweeteners. No Water. Just 100% fruit & vegetables. 4. An endless list of fruit & vegetable combinations – who said that healthy choices had to be boring? We were living a very active life – going to the gym between 4 and 5 times a week, regular 4km run, touch rugby once a week, so we didn’t really worry about what we ate, we could, for the most part, out-gym an average-to-bad diet. But something provoked us to start paying more attention to our food, and on New Year’s Eve of December 2011, we made a New Year’s Resolution to stop eating processed foods with added sugar. The weeks that followed were extremely tough as we struggled to deal with our sugar-withdrawal symptoms, and as we contended with the new-found awareness that more than 80% of the food we were regularly consuming contained added sugar – even foods that were labelled as “healthy”. Once we found a new equilibrium however, discovering food options, drinks and restaurants that aligned with our lifestyle choice, and once we started seeing the impact on our bodies as we shed excess weight that was unnecessarily retained because of our food options, we grew addicted to clean-eating, and our physical health and wellness is exponentially better as a result of our diet choices. The vision for Terra is therefore borne of the desire to ‘mainstream’ healthy food. Clean food should be the norm, rather than the exception, and one should not have to pick-up item after item on the supermarket shelf or refrigerator to find that it contains added sugar which invariably has a negative health impact on your average person. Ours is, however, not a crusade against any lifestyle choices, and foods and drinks that people may choose to have, rather we seek to provide an alternative to the products in the mainstream, and to give you the option to make a choice to consume something with full knowledge and awareness of its impact on your health and wellbeing. 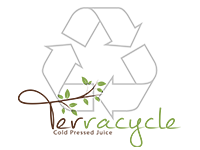 At Terra Lifestyle Company, we take responsibility for our impact on the environment! We have therefore launched “Terracycle”, our recycling initiative. The goal is to make sure that each of our bottles gets recycled responsibly, keeping our environment in the best shape possible. Through Terracycle, we encourage all our customers to keep their empty bottles and return them to us when they make their next purchase. We have set up collection points at each of our outlets, and customers ordering directly from us can give their empty bottles to our delivery guy to return to us. Terra is a total team effort. Every tiny detail is important in making sure that we can deliver fresh, healthy, Cold Pressed Juice to our customers consistently – from buying the produce at the market, cleaning it, shredding it, pressing it, bottling it, labelling it and finally, delivering it. And then, of course, there is the marketing team that works tirelessly to ensure that we can get the Terra-Word out there! The team is led and coordinated by Tsholo and Shiku.